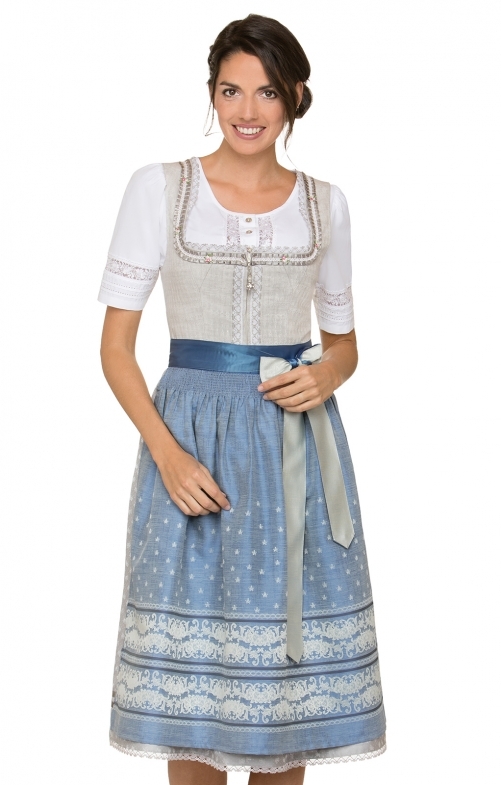 Midi-Dirndl Lampa for women by Stockerpoint in nature and blue. Classically restrained yet elegant, the lovingly designed country costume enchants Dirndl. The bodice, with a classic neckline, is finished with colour-coordinated ribbons and a fine lace. The feminine, pleated skirt is processed with a lace and a back pocket provided. The stylish apron with exclusive traditional motif and two-coloured apron ribbon is wonderfully combined and refines this traditional model. habe bei euch Dirndl probiert in Gr. 48 und war noch zu klein.